Recently, a teleportation scheme using a two-mode squeezed state to teleport a photonic qubit, so called a “hybrid” approach, has been suggested and experimentally demonstrated as a candidate to overcome the limitations of all-optical quantum information processing. We find, however, that there exists the upper bound of fidelity when teleporting a photonic qubit via a two-mode squeezed channel under a lossy environment. The increase of photon loss decreases this bound, and teleportation better than this limit is impossible even when the squeezing degree of the teleportation channel becomes infinity. Our result indicates that the hybrid scheme can be valid for fault-tolerant quantum computing only when the photon loss rate can be suppressed under a certain limit. D. Bouwmeester, J.-W. Pan, K. Mattle, M. Eibl, H. Weinfurter, and A. Zeilinger, “Experimental quantum teleportation,” Nature 390, 575–579 (1997). T. C. Ralph and G. J. Pryde, “Optical quantum computation,” in Progress in Optics (Elsevier, 2010), Vol. 54, pp. 209–269. Y. Li, P. C. Humphreys, G. J. Mendoza, and S. C. Benjamin, “Resource costs for fault-tolerant linear optical quantum computing,” Phys. Rev. X 5, 041007 (2015). W. P. Grice, “Arbitrarily complete Bell-state measurement using only linear optical elements,” Phys. Rev. A 84, 042331 (2011). F. Ewert and P. van Loock, “3/4-efficient bell measurement with passive linear optics and unentangled ancillae,” Phys. Rev. Lett. 113, 140403 (2014). S.-W. Lee, K. Park, T. C. Ralph, and H. Jeong, “Nearly deterministic Bell measurement for multiphoton qubits and its application to quantum information processing,” Phys. Rev. Lett. 114, 113603 (2015). H. A. Zaidi and P. van Loock, “Beating the one-half limit of ancilla-free linear optics Bell measurements,” Phys. Rev. Lett. 110, 260501 (2013). S. L. Braunstein and H. J. Kimble, “Teleportation of continuous quantum variables,” Phys. Rev. Lett. 80, 869–872 (1998). L. Vaidman, “Teleportation of quantum states,” Phys. Rev. A 49, 1473–1476 (1994). S. Lloyd and S. Braunstein, “Quantum computation over continuous variables,” Phys. Rev. Lett. 82, 1784–1787 (1999). N. C. Menicucci, P. van Loock, M. Gu, C. Weedbrook, T. C. Ralph, and M. A. Nielsen, “Universal quantum computation with continuous-variable cluster states,” Phys. Rev. Lett. 97, 110501 (2006). A. Furusawa, J. L. Sørensen, S. L. Braunstein, C. A. Fuchs, H. J. Kimble, and E. S. Polzik, “Unconditional quantum teleportation,” Science 282, 706–709 (1998). R. Polkinghorne and T. Ralph, “Continuous variable entanglement swapping,” Phys. Rev. Lett. 83, 2095–2099 (1999). T. Ralph, “Interferometric tests of teleportation,” Phys. Rev. A 65, 012319 (2001). 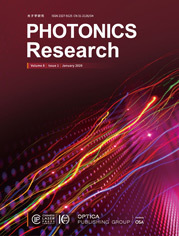 S. Takeda, T. Mizuta, M. Fuwa, P. van Loock, and A. Furusawa, “Deterministic quantum teleportation of photonic quantum bits by a hybrid technique,” Nature 500, 315–318 (2013). N. C. Menicucci, “Fault-tolerant measurement-based quantum computing with continuous-variable cluster states,” Phys. Rev. Lett. 112, 120504 (2014). H. Jeong, J. Lee, and M. S. Kim, “Dynamics of nonlocality for a two-mode squeezed state in a thermal environment,” Phys. Rev. A 61, 052101 (2000). C.-W. Lee and H. Jeong, “Quantification of macroscopic quantum superpositions within phase space,” Phys. Rev. Lett. 106, 220401 (2011). S. Takeda, T. Mizuta, M. Fuwa, H. Yonezawa, P. van Loock, and A. Furusawa, “Gain tuning for continuous-variable quantum teleportation of discrete-variable states,” Phys. Rev. A 88, 042327 (2013). H. F. Hofmann, T. Ide, T. Kobayashi, and A. Furusawa, “Fidelity and information in the quantum teleportation of continuous variables,” Phys. Rev. A 62, 062304 (2000). A. Einstein, B. Podolsky, and N. Rosen, “Can quantum-mechanical description of physical reality be considered complete?” Phys. Rev. 47, 777–780 (1935). T. Ide, H. F. Hofmann, A. Furusawa, and T. Kobayashi, “Gain tuning and fidelity in continuous-variable quantum teleportation,” Phys. Rev. A 65, 062303 (2002). K. Życzkowski, P. Horodecki, A. Sanpera, and M. Lewenstein, “Volume of the set of separable states,” Phys. Rev. A 58, 883–892 (1998). G. Adesso, A. Serafini, and F. Illuminati, “Extremal entanglement and mixedness in continuous variable systems,” Phys. Rev. A 70, 022318 (2004). G. Vidal and R. F. Werner, “Computable measure of entanglement,” Phys. Rev. A 65, 032314 (2002). K. Audenaert, M. Plenio, and J. Eisert, “Entanglement cost under positive-partial-transpose-preserving operations,” Phys. Rev. Lett. 90, 027901 (2003). C. M. Dawson, H. L. Haselgrove, and M. A. Nielsen, “Noise thresholds for optical quantum computers,” Phys. Rev. Lett. 96, 020501 (2006). A. Lund, T. Ralph, and H. Haselgrove, “Fault-tolerant linear optical quantum computing with small-amplitude coherent states,” Phys. Rev. Lett. 100, 030503 (2008). D. A. Herrera-Marti, A. G. Fowler, D. Jennings, and T. Rudolph, “Photonic implementation for the topological cluster-state quantum computer,” Phys. Rev. A 82, 032332 (2010). S.-W. Lee and H. Jeong, “Near-deterministic quantum teleportation and resource-efficient quantum computation using linear optics and hybrid qubits,” Phys. Rev. A 87, 022326 (2013). A. Schönbeck, F. Thies, and R. Schnabel, “13 dB squeezed vacuum states at 1550 nm from 12 mW external pump power at 775 nm,” Opt. Lett. 43, 110–113 (2018). Fig. 1. Fidelity change over the gain value g between −2 and 2 with a varying amount of losses in the two-mode squeezed state. Fig. 2. Fidelity curves over the gain value g between −2 and 2 changing as the loss rate r2 increases. Fig. 3. Transmission fidelity of a photonic qubit with numerically optimized gains. Here, q is the squeezing parameter of the initial two-mode squeezed state; the maximum fidelity curve is numerically obtained and plotted with the thick dashed curve, and that of q=1 is plotted with the thin dotted curve. It is impossible to attain fidelity higher than the classical limit (horizontal dotted line) with loss bigger than about 11%. Fig. 4. Log negativity of the two-mode squeezed state in terms of the loss rate r2. On the contrary to the fidelity, there is no inversion in order with increasing loss. (A7) 1π∫Cd2x xnx*m exp(−a|x|2+b1x+b2x*)=1a∂n∂b1n∂m∂b2mb2 exp(b1b2a).